The sign makes you ponder when you enter Tonopah, Nev. What’s a mucker? Image by Tom Adkinson. TONOPAH, Nev. – A chance conversation led to my meeting a mucking champion, and that’s no typo. It happened in the desert town of Tonopah, which is in the middle of nowhere between Las Vegas and Reno. Who could say “No” to a question like that? Donna Otteson held Nevada’s female mucking record for 22 years. Image by Tom Adkinson. 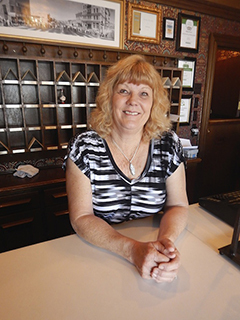 My local lingo teacher was Donna Otteson, manager of the Mizpah Hotel and owner with her husband of Otteson’s World Famous Turquoise, a tourist-oriented mining business. Donna was behind the hotel front desk, and the only possible improvement on our conversation would have been if I had met Donna at the hotel bar. She had a two-beer story. 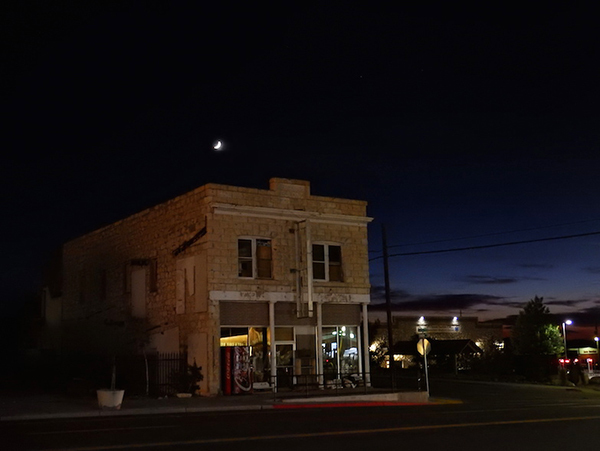 Tonopah was — and is to a certain extent even today – big mining country (also stargazing country because it’s so far from big-city lights). Settler Jim Butler got people stirred up in 1900 with a silver ore discovery, and by 1901, there were enough mines in the area to produce $750,000 worth of gold and silver, according Tonopah’s online history. Muckers, she explained, were the guys in the old days of underground mines who loaded ore (muck) into ore cars so it could be rolled to the surface and processed. Muck is a mix of silver (very little by volume), rock and dirt. Shoveling loads of muck was backbreaking, uninspiring work. Tonopah is known for mucking . . . and dark night skies perfect for stargazing. Image by Tom Adkinson. “See that pile of muck? Shovel it into the ore car as fast as you can. That’s it,” she said rather matter-of-factly. Men shovel one ton; women shovel half a ton. There also are team mucking events and events for youngsters. The first age category is 3-6. The kids in Tonopah must be tough little critters. In 1992, Donna flew through her half-ton of muck in a time of 2:04. That’s two minutes and four seconds, not two hours and four minutes. It was a record that stood for 22 years when someone shaved three second off her time. “I come from a very competitive family,” she deadpanned, offering only that to explain her success. She acknowledged that leg strength is more important than back strength, but the very thought of shoveling a half-ton of anything in two minutes makes me hurt all over. Did she have a magic shovel, or even a special one? “Nope. I used a regular rounded shovel, not a square one. You sometimes hit rock, and the round edge is better when that happens,” she explained. So there you have it. Curiosity about an odd word led to a great conversation and a meeting with a champion. Discovering silver out in the desert would have been a bigger thrill, but meeting a champion was still a treat.